Anyone who speaks of their first time in the ring in terms of the sweat or the heat, the overwhelming fatigue or the numbing fear, the grittiness of the sand under foot, or the particular odour the Spanish fighting bull brings with it from the corrals, is either lying, misremembering or deranged. For such detailed cognition is not how such massive levels of acute stress work in the normal human mind. When you are first faced with a bull your world consists of two things: the animal’s eyes and where they are looking, and the animal’s horns and where they are going. As the saying goes of war: there are far too many things to be afraid of to have time to be scared. By the time I was facing a big animal – three years old and weighing a third of a ton – I had learned how to control that adrenal flow so that I could devote time to reading the animal. For example, seeing which horn he preferred to lead with (like boxers, bulls are either southpaw or orthodox), and noticing whether he wanted to break into a canter in a close-range charge or preferred merely to extend his trot. Then there was the choice of pass I’d make with the muleta – the red cloth with a wooden stick for a spine – extended wider with the sword in its folds when used for a derechazo on the right, or on its own on the more risky, but more elegant, left for a pase natural. 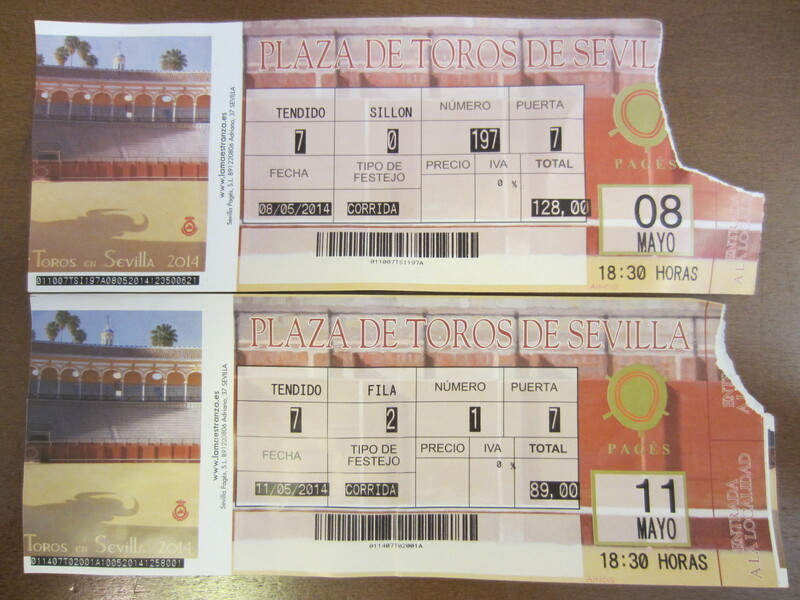 Proponents of bull runs and bullfighting cite them as joyous cultural events, and dispute that they are frivolously cruel. 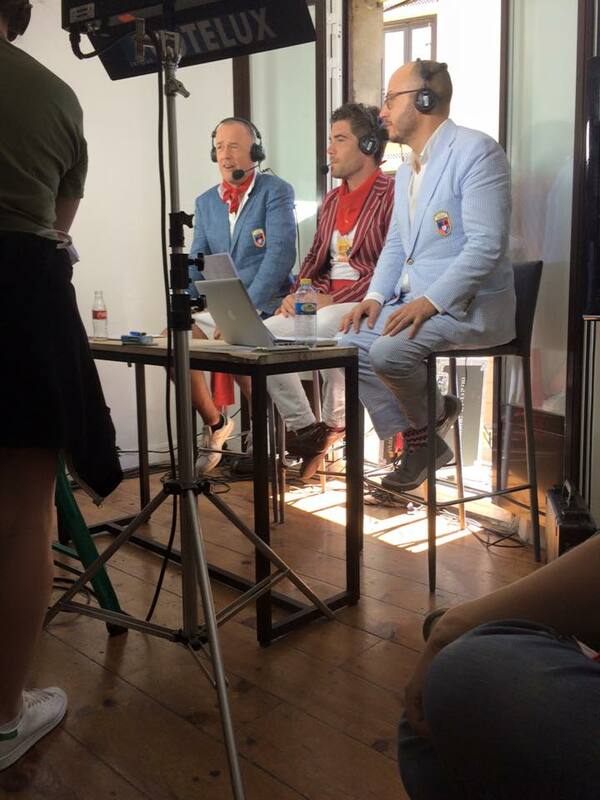 Alexander Fiske-Harrison, author of Into the Arena: The World of the Spanish Bullfight, argued in a February speech that bulls raised for bullfighting have, on the whole, far better lives than most cattle raised for meat. This “stabbed repeatedly until they become paralyzed” is in fact an almost surgical severing of the spinal column at the base of the skull which severs both motor neurones – i.e. those which facilitate movement – and sensory neurones – i.e. those which allow any sensation. It is a coup de grace by a skilled executioner with a broad-bladed dagger – the puntillador – of far greater effect (and affect) than the bolt gun which only extremely rarely will destroy enough brain tissue to prevent a feeling portion still connected to a fully functional spine remaining operational for a short while. 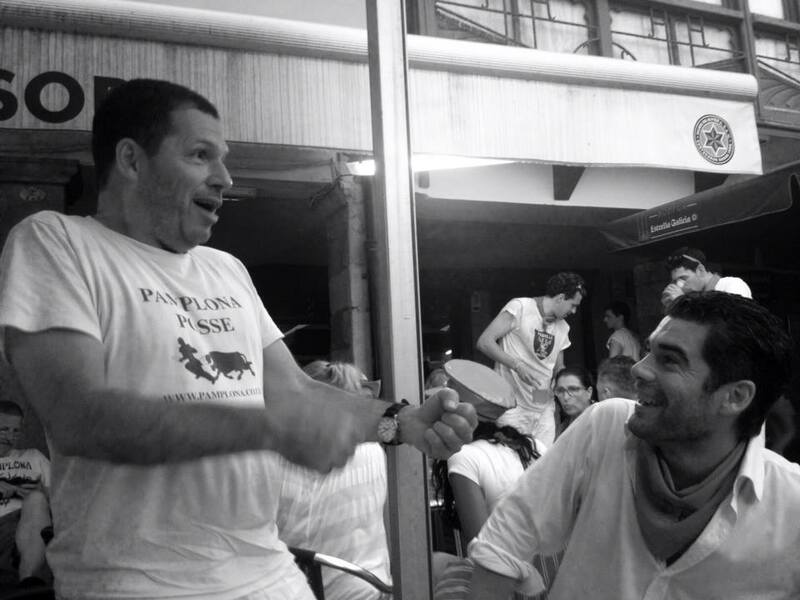 I am in Pamplona at the moment running with the bulls and you can read more about it at ‘The Pamplona Post’. 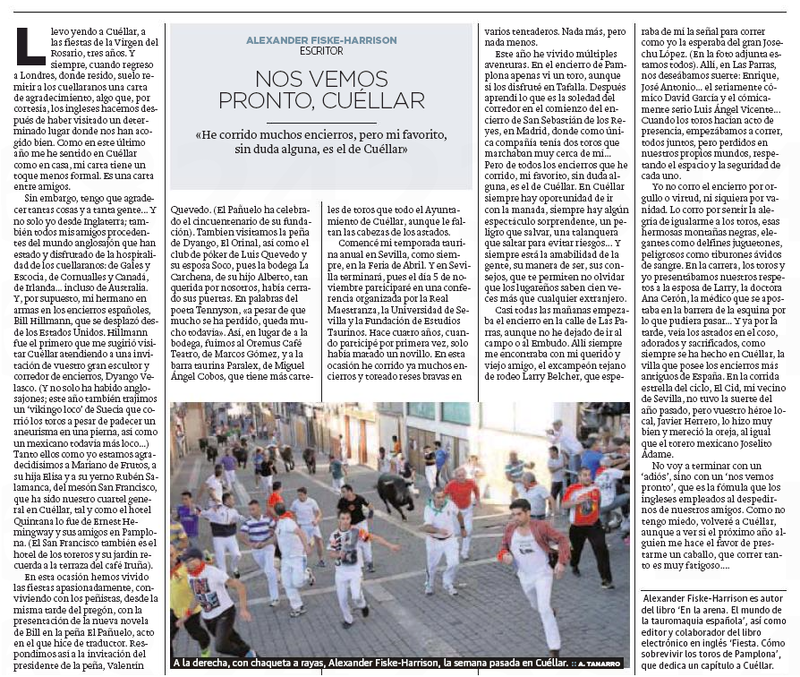 If you are on your way, I strongly recommend you read my guide to surviving the experience in Spain’s English-language newspaper, The Local, online here. 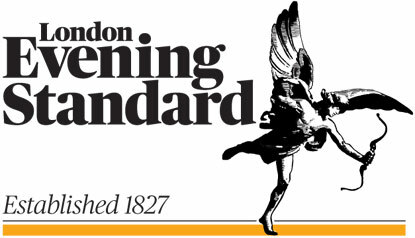 As you can see, the publicity machine has already begun to turn, beginning with the Londoner’s Diary of the Evening Standard below, and SanFermin.com in Pamplona here. Now to finish my articles for The New York Times, Newsweek, hopefully The Toronto Star and, I believe, The Times. Someone hide the red flags. 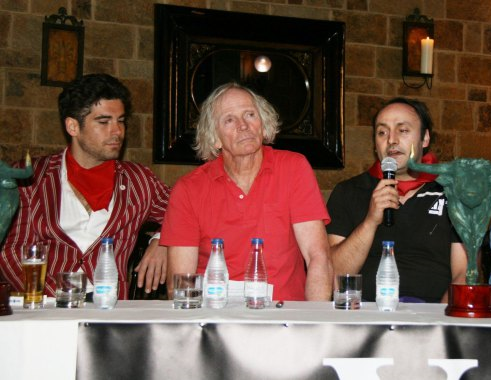 The actor, writer and “bullfighter-philosopher” Alexander Fiske-Harrison has teamed up with John Hemingway — grandson of the novelist and blood-sports enthusiast Ernest — to put together a collection of essays and accounts of the infamous Spanish bull-running festival. 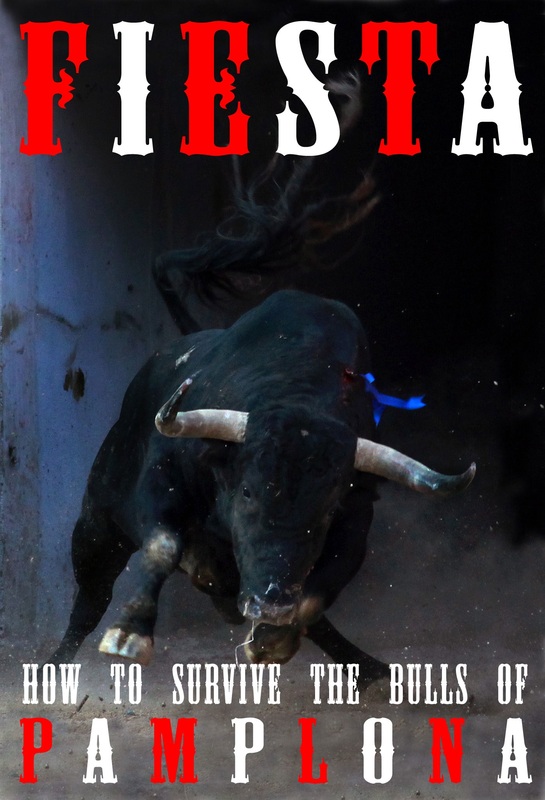 Fiesta: How to Survive the Bulls of Pamplona also includes a brief memoir by the daughter of another famous bullfighting enthusiast — the film director Orson Welles. 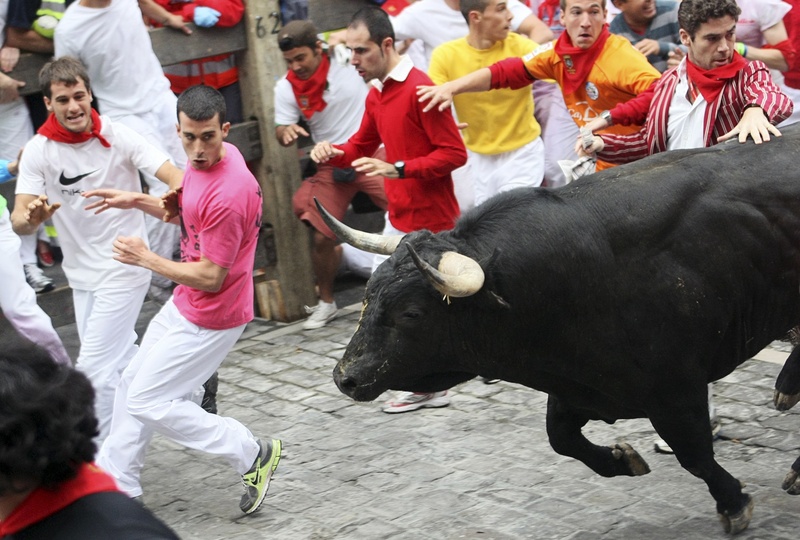 The Encierro – the ‘bull-run’ – is rooted deep in the history of Pamplona, where the bulls have, since medieval times, been driven for the evening bullfight from outside the city’s walls to its centre. 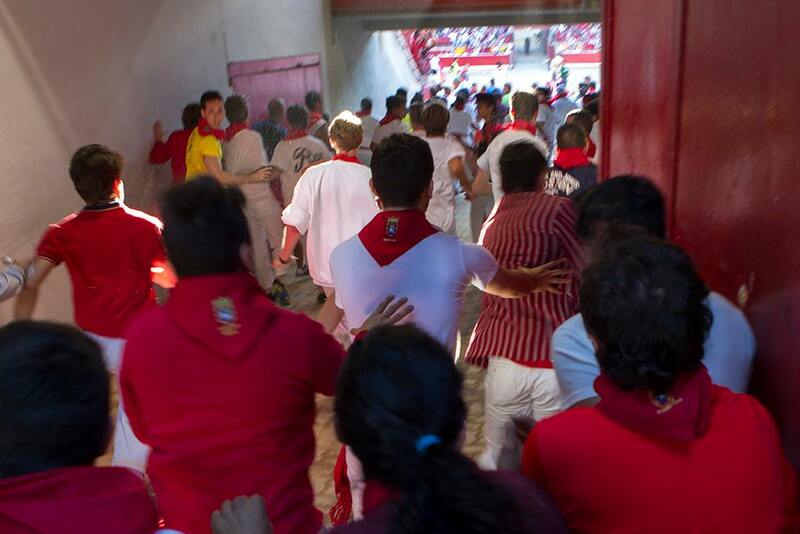 Over the centuries, the Encierro has grown until it has become a legendary race, combining the weight of a tradition amassed over decades and the universal reach of an international event in the 21st century. 1776 gave us the introduction of fencing on the route of the Encierro; in 1856 the bulls ran for the first time on calle Estafeta; in 1922 the layout we have today was finally settled; in 1974 the start of the race was changed to 8 o’clock in the morning; in 1982 they began live television broadcasts, and this year the Encierro Ordinance has been approved, which regulates the conditions under which the run occurs and establishes appropriate mechanisms to punish (in ways which are minor, serious and very serious) behaviors that are not allowed. With all its sharp edges, its beauty, its danger and its difficulties, the Encierro is now a spectacular space, with close to 3,500 runners risking their lives every morning, backed up by first-class support along the entire route and with more than 440 journalists accredited to send their updates to countries in all continents. 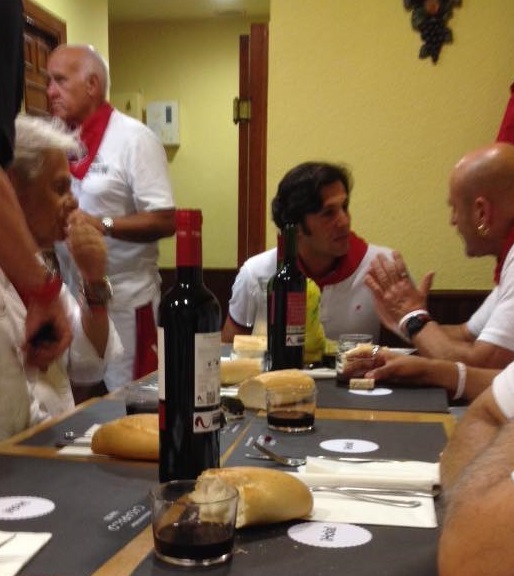 However, beyond the importance of the Encierro, the appeal of the fiestas of San Fermín are not just in the legendary run. We have eight and a half days full of joy and fun, and with a festive array composed of more than 400 events, most notably the Chupinazo, Procession and dances of the Giants and Big Heads, that underpin the excellent environment that lives on the streets of Pamplona and serves to renew year after year, the greatness of an long-awaited and heartfelt holiday. 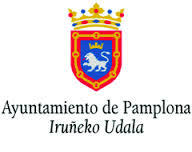 As Mayor of Pamplona it is a great joy to participate in a book like this, especially one aimed at the English-speaking community, because of its commitment to approaching the San Fermín liturgy with respect for the traditions of Pamplona as its roadmap, and valuable testimonies from people who have, over decades, learned how participate in the Encierro with aplomb. In this sense, I want to take the opportunity afforded to me in this foreword to congratulate Alexander Fiske-Harrison for this story, and all those who took part in this project. 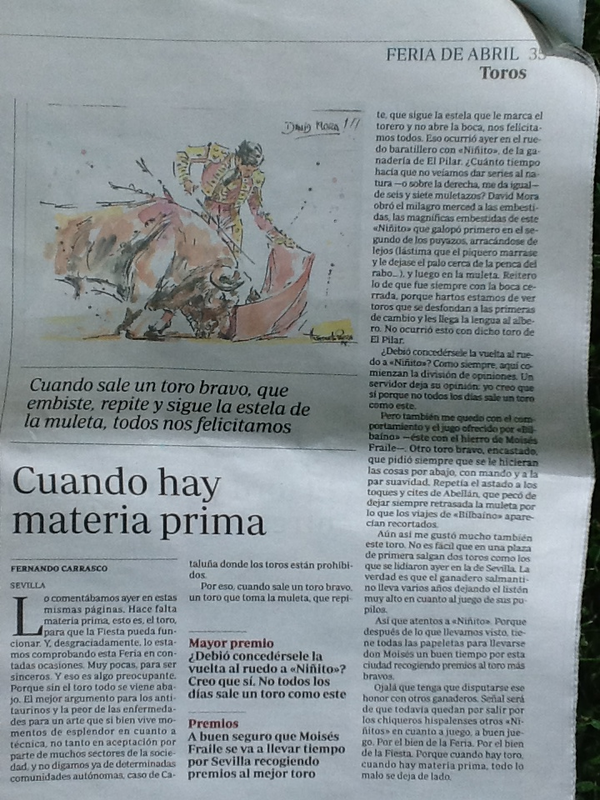 I am sure that this work will become a great reference for all lovers of the Encierro beyond our borders, and serve as a source of information for people who want to find out the details that have defined, for centuries, the most famous bull-run in the world. And finally, a tip. If you have the opportunity to visit, do not hesitate. Pamplona awaits you with open arms and with only two conditions: the desire to have a good time and respect for the city and its traditions. 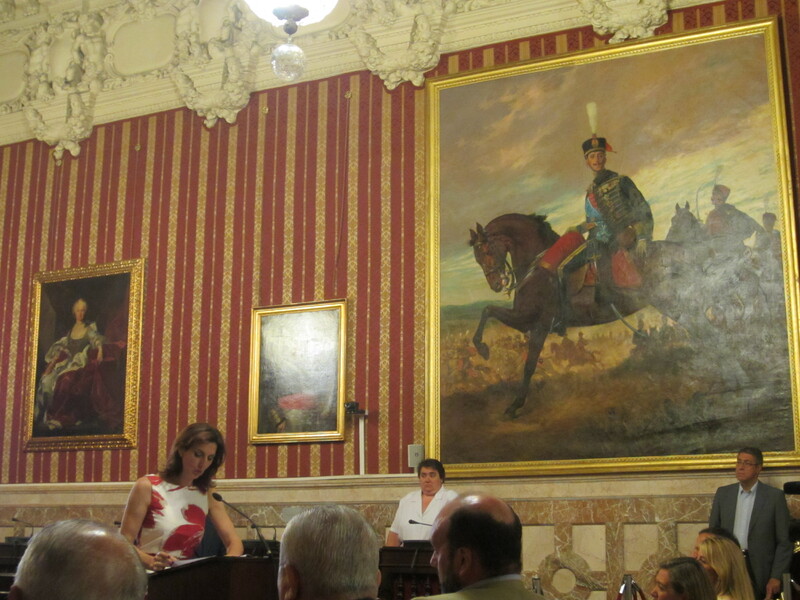 With thanks to Doña Yolanda Barcina, President of the Government of Navarre. And to His Excellency, Federico Trillo-Figueroa Martínez-Conde, Ambassador from the Kingdom of Spain to the United Kingdom of Great Britain and Northern Ireland and El Señor Fidel López Álvarez, Minister-Counsellor for Cultural Affairs. On Friday morning we took the train from Seville to Jerez de la Frontera and the temperature went south with us to a pleasant 30 degrees. 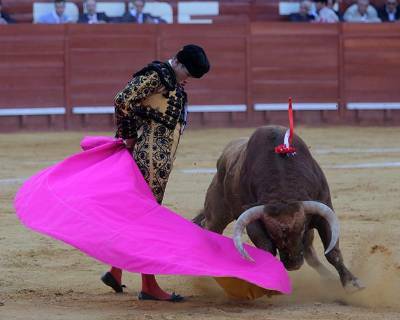 Article 46: The minimum weight of animals in bullfights will be from 460kg in rings of the first category, from 435 in those of the second and 410 in those of the third. 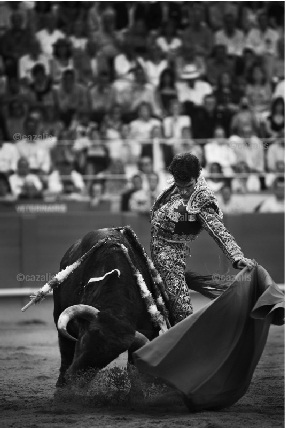 Article 45: The males that are destined to be fought in corridas de toros (‘bullfights’) should be as a minimum four full years and in every case less than six. – this still offers a two year range which is the difference between headlong aggression and a more judicious and challenging approach to what the bull, at least, experiences as a combat. 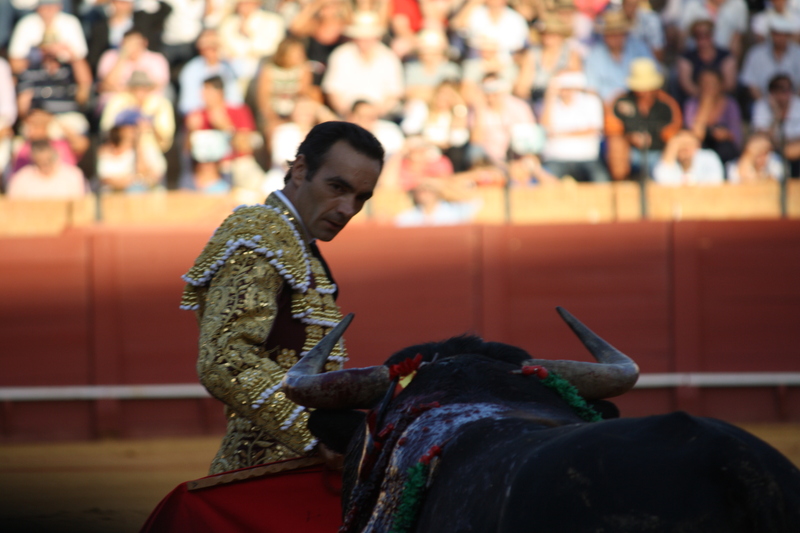 Of the corrida of bulls from El Pilar we saw in Seville, not only were four of the six over 550kg, but four were also over five years old (the overlap between the two groups being three of four). In part this explained their lack of nobleza, ‘nobility’, a concept which can be explicated in terms of unquestioning aggression or volatile stupidity, depending on your viewpoint.